It is your right as a citizen to have Federal Tax Professionals file a true tax return on your behalf to replace the Substitute for Return that the IRS filed for you. Once the IRS receives and processes your new tax return, they will void the one they originally created. By law, the IRS must allow you to file over these Substitute Tax Returns. 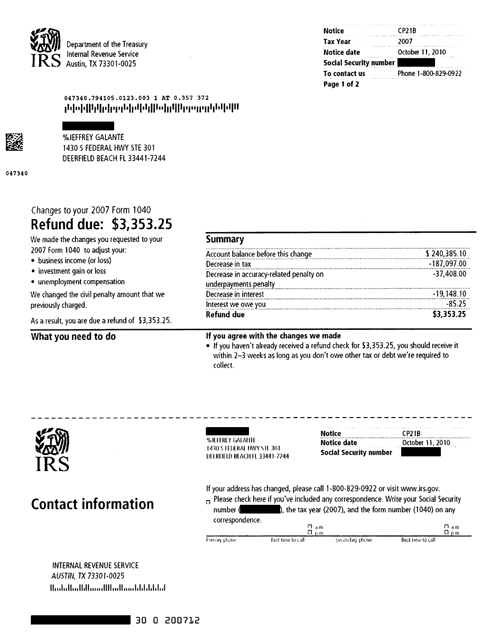 The IRS then zeroes out the debt and will calculate the tax, penalties and interest based on your new and true return. In many cases, the outcome is little or no debt, and there may even be a refund coming to you! If the IRS owes you a refund, they will place it against any outstanding debt and send you a refund for the rest. Fortunately for taxpayers, Federal Tax Professionals can prepare multiple years of tax returns in a matter of days. Federal Tax Professionals can help you prepare proper returns and make sure you do not pay the IRS $1 more than is necessary. IRS collections is under no obligation to explain your rights. Their primary goal is to collect the debt. Technically speaking, you can leave the IRS Substitute Return as is. But in nearly every case, it is beneficial to file your own true tax return. Do not fall victim to IRS persuasion. Do yourself a favor and call Federal Tax Professionals to determine the best way to handle your case.